The Economic Education Committee of the Chamber undertook the survey. Wilson said the goal is to provide information to the Board of Commissioners, to Chamber members and to the public about the issue. The survey did not ask members to indicate how they would vote on liquor by the drink if it were on the ballot. Wilson, general manager of the AmeriPride facility in Watkinsville, said he believes some Chamber members want the issue on the ballot so it can pass and others want it on the ballot so it will fail. 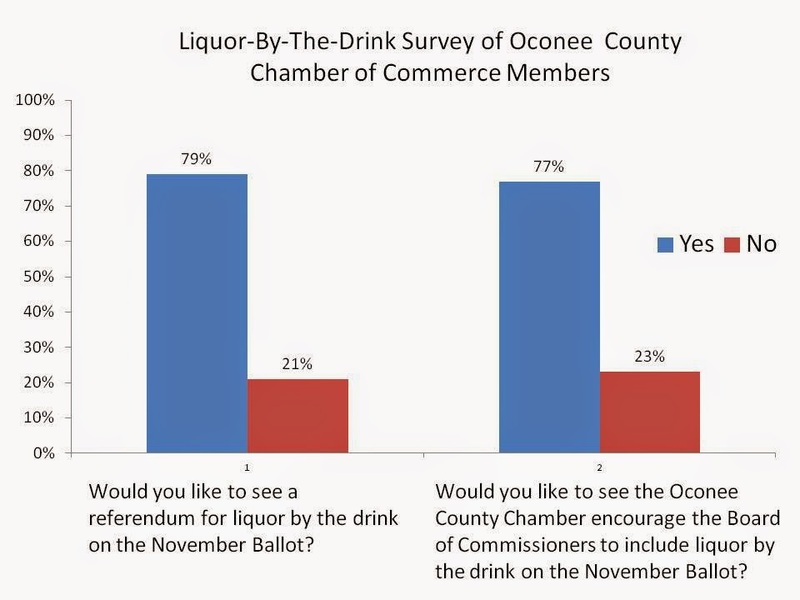 The survey did ask Chamber members if they think liquor by the drink affects the growth and development of the county, and 90 percent said they did. Ninety percent also said they would like more restaurants in the county. The survey was emailed to Chamber members in May. According to the report of the findings, released in the Chamber electronic newsletter and on the Chamber website on Monday, 30 percent of the Chamber members responded. The newsletter did not give any indication of the representativeness of the sample to the population of Chamber members. Chamber President Kay Keller told me on Tuesday that the full Chamber is waiting on guidance from the Economic Education Committee on what should be done next with the results of the survey. Frank Bishop, developer of Epps Bridge Centre, called in January at a Chamber Banquet for the BOC to put the issue of liquor by the drink on the ballot. Restaurants can sell beer and wine with food now on every day but Sunday, but they cannot sell other alcoholic beverages at any time. The issue will have to come before the BOC in the next few months if it is to be on the November ballot. Oconee County BOC Chairman Melvin Davis said at Commission meeting on Tuesday that the group will need to vote prior to Sept. 4 to put the referendum for the 2015 Special Purpose Local Option Sales Tax on the ballot in Nov. 4. That same timeline will hold for the liquor-by-the-drink referendum. The Board at present has meetings scheduled for June 24, July 8, July 29, Aug. 5, Aug. 26, and Sept. 2. Sorry Frank Bishop, we're not here just for your bottom line. We'll continue to support non-chain county restaurants that are doing just fine serving beer & win. We don't really need an Applebee's or Ruby Tuesday's. it goes back into the community. And as a result we get better restaurant, hotel with conference centers. Bottom line economic development for the County. Of course, maybe you want higher taxes. Frank Bishop built an incredibly ugly strip mall, which will have a life span of 15 years before it's dollar schools and half vacant. And trust me, he wouldn't be begging for liquor by the drink if he wasn't going to profit from it. The commissioners appropriately duck this question with the standard "put it on the ballot." It's a hot-button issue past the provisions of the four or five votes of the BOC. Well, it's time again for the responsible adults to vote. Oconee hasn't devolved into the pit of fire since beer and wine. We'd probably survive joining the rest of the world allowing cocktails before dinner with similar rules, regulations and enforcement.